Sam Alexander was born a relatively average man. In his early 20’s he was actively pursuing a career in theatre and had been recently promoted at the Shubert Theatre in Chicago when personal disaster struck. Although the details are a little sketchy, Sam was ultimately involved in a huge gasoline explosion that was the result of his own carelessness. While h...e was able to instinctively save his eyes by raising his arm, he received deep burns around his lips and lower face. Even more unfortunate, his wounds festered and became severely infected. Doctors were forced to remove much of his lower face and lips, practically to the bone. As a result, Sam Alexander was left with a permanent and disturbing teeth-gnashing grimace and a gruesome visage. Sam spent thirteen months physically recovering from his wounds in a Chicago hospital. His mental scars perhaps ran deeper than his physical ones as he was forced to endure the gasps of new nurses and the lack of eye contact from visiting loved ones. Following his recovery, Sam Alexander was placed in a halfway house, a facility for people with little or no hope of social recovery. However his fortunes changed slightly when a doctor referred him to a prosthetics master and a lifelike mask was cast and created in an effort to fake a normal appearance. In a certain light, the facade was somewhat convincing but extremely limiting and Sam Alexander was still despondent as his saw little chance to earn a livelihood in a society that was appearance driven. Sam was a driven and ambitious man, which made his confinement all the more unbearable. One morning, as Sam read the paper, he saw an ad for the Pete Kortes Sideshow. The show was touring and was set up close to the halfway house. Same attended the show, introduced himself to Kortes and unmasked to show the ringmaster what he had to offer. Kortes was horrified and hired Sam on the spot. Sam began touring almost immediately and instantly caused a stir. Billed as ‘The Man with Two Faces’, Sam’s exhibition consisted primarily of a stage monologue detailing his story. Sam was a soft-spoken man with a gentle manner and soothing voice. He so lulled the crowd with his tale of heartbreak that when he revealed his face in a surprising flourish, people screamed and women cried. His showcase was so disturbing that Kortes made Sam the Blow Off attraction, an extra attraction patrons had to pay a premium to see and he was sincerely billed as ‘not for the weak of heart’.At more than one venue, Sam Alexander was paid not to perform. Sam Alexander was soon in demand. During his career he joined the Ringling Bros. and Barnum & Bailey show, the Clyde Beatty Circus and worked for venerable showman Ward Hall from 1960 to 1967. Sam Alexander eventually even created and ran his own sideshow and was ultimately responsible for rescuing the legendary Schlitzie the Pinhead from institutionalized life. 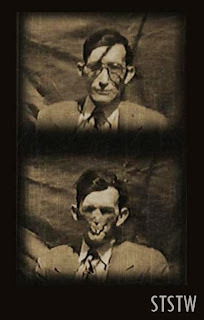 Despite it eventually becoming his livelihood, Sam Alexander endured seventy-two operations in his lifetime in the effort to restore his damaged face. While the operations were never quite completely successful, Sam eventually retired his mask regardless of the patchwork appearance his face bore. Sam was a man without a prejudice or bitter bone in his body and he was determined to live the last years of his life as himself – without hiding behind a mask. Sam Alexander passed away in 1997 and today is remembered fondly by all who knew him as a man with a kind heart and a face to match.